Ta Bacteria (bacteyryn) ny phossan mooar dy vynorgaanee phrokaryotagh un-chillagagh. T'ad ooilley-ynnydagh er feie ny cruinney; t'ad gaase 'sy thalloo, ayns geillyn ushtey çheh, jeeyll goul-rooragh, ushtey as kirp lossreeyn as beiyn bio. Ta mysh 40 millioon bacteyr ayns gramme dy halloo as millioon jeu ayns millileetyr dy ushtey villish; s'cosoylagh dy vel queig nonillion (5×1030) bacteyr er y chruinney. T'ad jannoo magh ayrn mooar jeh bea-chorpys ny cruinney. Ta mysh jeig keayrt smoo bacteyryn cummal er corp deiney na ta killagyn deiney ayn. Ta ram jeu er y chrackan as biota collaneagh. Ta'n chooid smoo jeu meeskielleydagh er coontey obbraghyn y chorys jeenaght, as ta fir jeu foayssagh dooin. Ta fir elley gorlagh as t'adsyn nyn minn ymmodee çhingyssyn, myr sampleyr, yn collyr, anthracs, louraneys as yn phlaih fairaigagh. Ta gorley shymlee marroo mysh 2 villioon sleih 'sy vlein, 'syn Affrick fo-Haharagh son y chooid smoo. Ta fir lhee jannoo ymmyd jeh noi-vaagh noi bacteyryn. 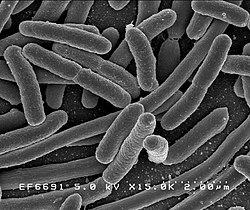 ↑ Bacteria (eubacteria). Taxonomy Browser. NCBI. Feddynit er 2008-09-10. ↑ Fredrickson JK, Zachara JM, Balkwill DL, et al. (July 2004). "Geomicrobiology of high-level nuclear waste-contaminated vadose sediments at the Hanford site, Washington state". Applied and Environmental Microbiology. Ym-lioar 70 (7): 4230–41. doi:10.1128/AEM.70.7.4230-4241.2004. PMID 15240306. ↑ 3.0 3.1 Whitman WB, Coleman DC, Wiebe WJ (June 1998). "Prokaryotes: the unseen majority". Proceedings of the National Academy of Sciences of the United States of America. Ym-lioar 95 (12): 6578–83. doi:10.1073/pnas.95.12.6578. PMID 9618454. ↑ Sears CL (October 2005). "A dynamic partnership: celebrating our gut flora". Anaerobe. Ym-lioar 11 (5): 247–51. doi:10.1016/j.anaerobe.2005.05.001. PMID 16701579. ↑ 2002 WHO mortality data. Feddynit er 2007-01-20. Hie yn duillag shoh er ny reaghey er 14 Boaldyn 2015, ec 18:46.